One of the wonderful things about the genealogical community is its commitment to sharing: information; tips; knowledge; the joy of discovery; even the pain of loss. It’s like another family to wrap around our own families, and especially at this time of year it’s a joy to be part of it. And, today, The Legal Genealogist wants to clue you in to a marvelous piece of work that’s being shared, free, by a member of our community, Michael Hait. Michael is a friend and a colleague, a certified genealogist who specializes in Maryland and African American research, a talented researcher and writer. And he’s just produced a free online guide called the United States Federal Census Pathfinder. This guide will direct you to online information concerning the U. S. Federal Census, including links to the manuscript and microfilm copies, digital images, authorizing acts of Congress, enumeration instructions, statistical compendia, maps, and much more. These resources will allow genealogists and historians to best utilize the U. S. Census in their research. It’s a wonderful piece of work, starting with an inventory of general information resources ranging from census forms to full explanations of each of the census years and the data collected, and then proceeding census by census from 1790 through 1940 with individual resources for understanding and getting the most out of each set of census records. For each individual census, Michael provides links to the statute authorizing the census, where to find manuscript copies and digital images, explanations of what the census takers were told and statistical reports that help us all better understand the information uncovered in the census. He provides links to information about some lesser-known census schedules as well, such as the 1820 manufacturing census and the 1930 census of merchant seamen, and to maps and other tools useful to genealogists. It’s not by itself a how-to guide — it’s a resource guide. But using the resources provides the how-to, and gives us all a better chance of getting every bit of goody out of the census records that’s there to be gotten. So download the United States Federal Census Pathfinder today, and make it part of your census toolbox. Nicely done, Michael! Thank you! Thank YOU for making it available, Michael. Nice piece of work. 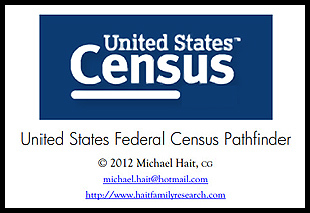 Thank you for sharing the link to the Federal Census Pathfinder, and thanks to Michael. However, I open the PDF and at the very top is the copyright symbol. I try to respect such things, but I have become paranoid of late on this subject. I’m surprised you didn’t mention this in your blog post. I would like to include a link in our local genealogy society newsletter. I suspect there are no issues, but I will sleep better with assurances. I’m sorry this caught you by surprise, Doug. Rest assured, you can ALWAYS include a link to an online publication without any copyright concerns whatsoever — no additional permissions required. If you wanted to republish the entire item, then you’d need Michael’s permission as the copyright owner. But a link? Always perfectly okay. Judy, thank you for making us aware of this. Michael, thank you for creating the US Federal Census Pathfinder and making it available to us. What a useful Christmas gift – I look forward to using it greatly in the new year! You and me, both, Doug, on using this in the new year!! I see a lot of what look like very useful links, but when I hover over them, I see the URL, but the arrow disappears and I’m not able to click on them. Is this a problem with the PDF? Dan, all the links work just fine for me both in the downloaded file and on Michael’s site. I’m using Adobe Acrobat 9 as my reader, and both Firefox and Chrome as my browser, and I can’t duplicate the problem.